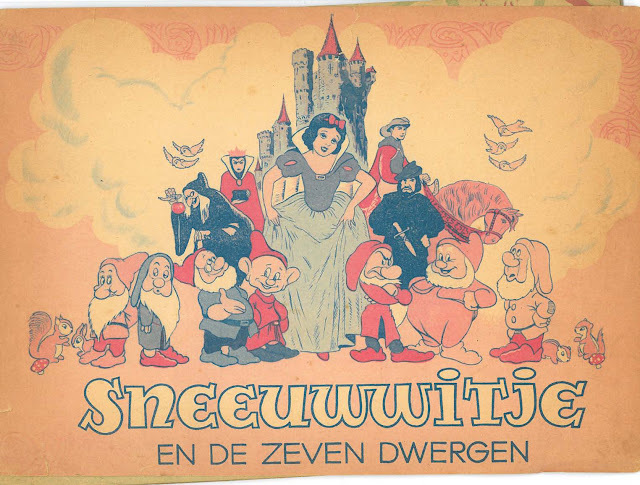 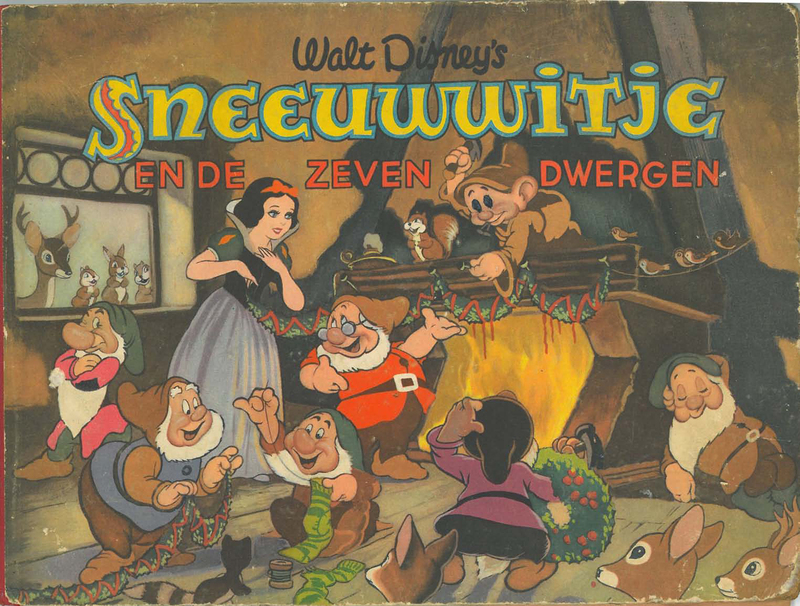 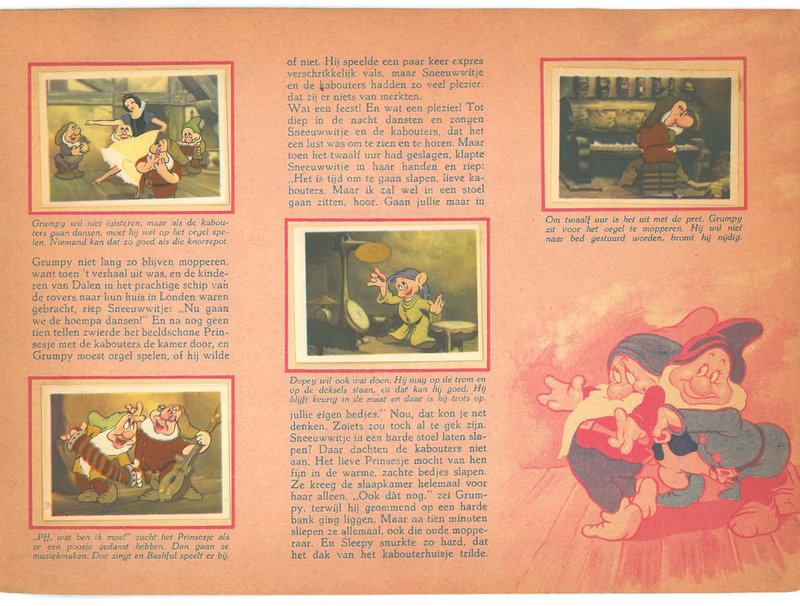 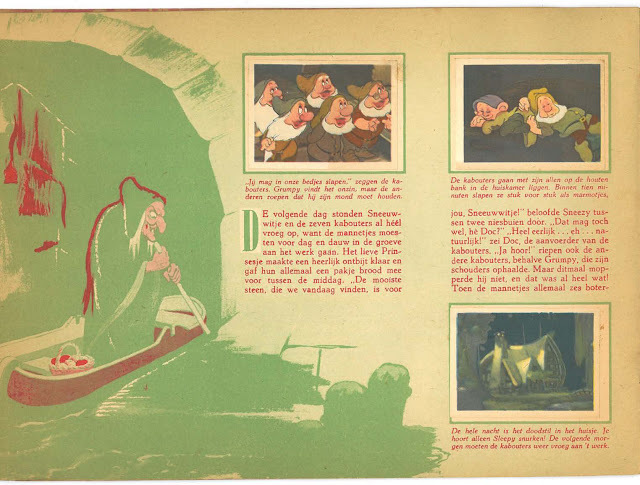 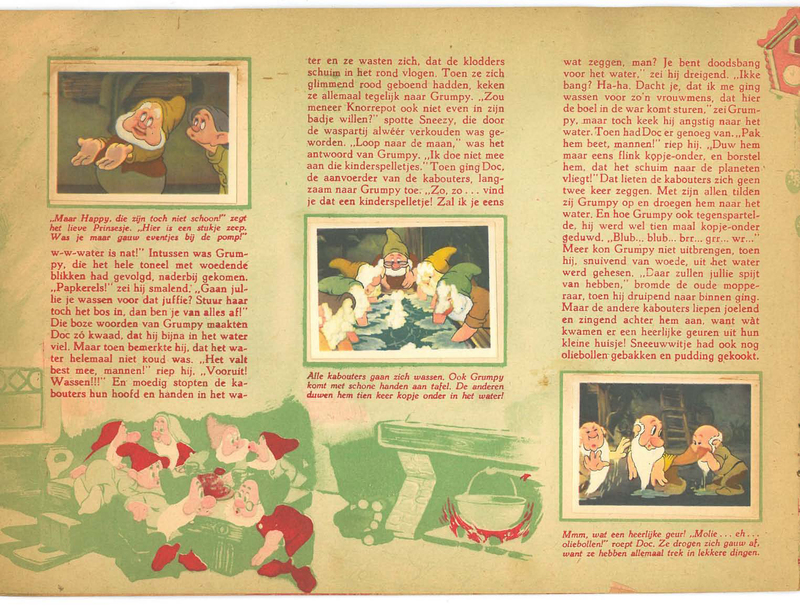 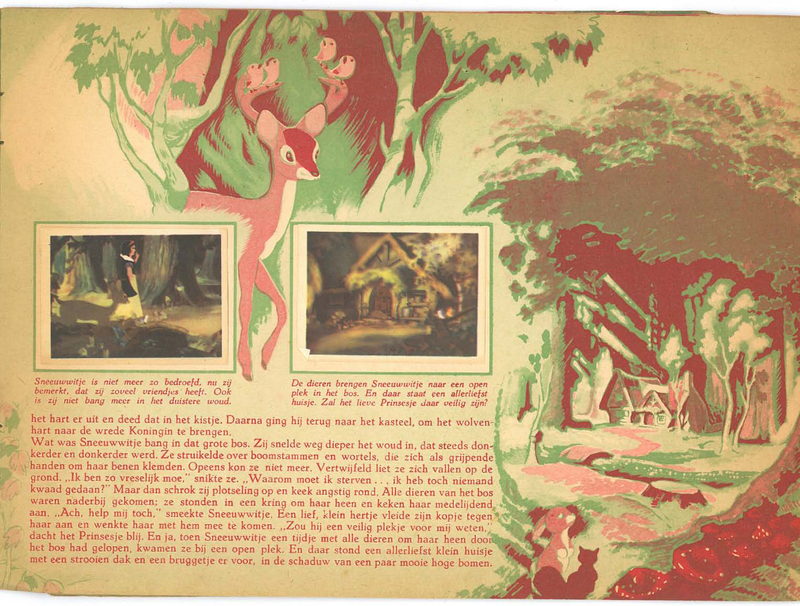 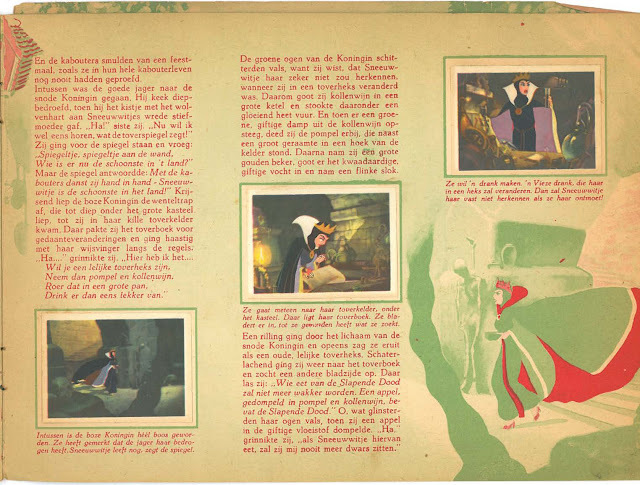 This Dutch Sneeuwwitje en de Zeven Dwergen book comes from long-time Disney collector H.P. Hogenboom. We saw in a previous post a few examples of Belgian sticker books that were produced in both the French and Dutch languages. 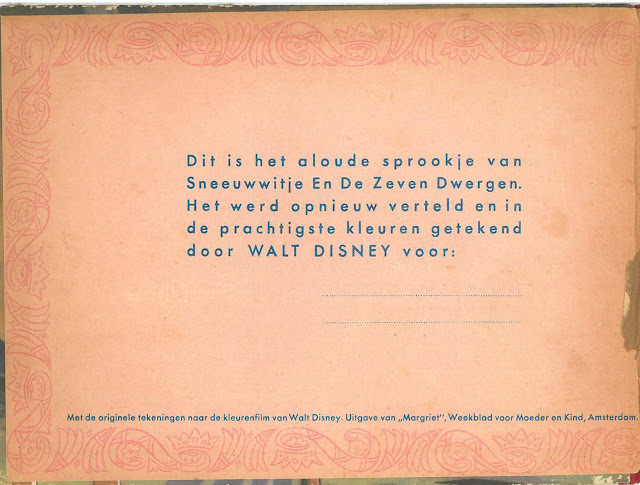 Set amongst the text are blank spaces for the reader to place collectible stickers (which were obtained separately). 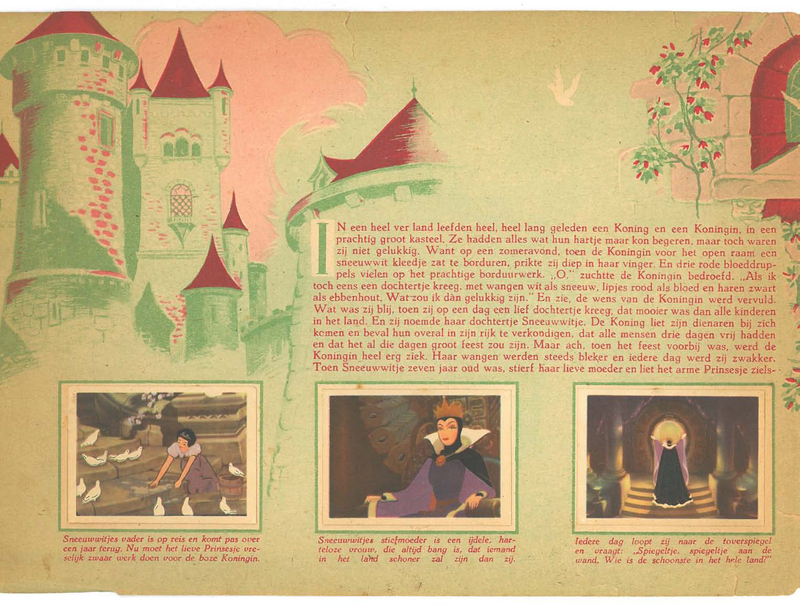 Unlike these earlier examples, however, the pages in this book from the Netherlands contain illustrations to accompany the story. 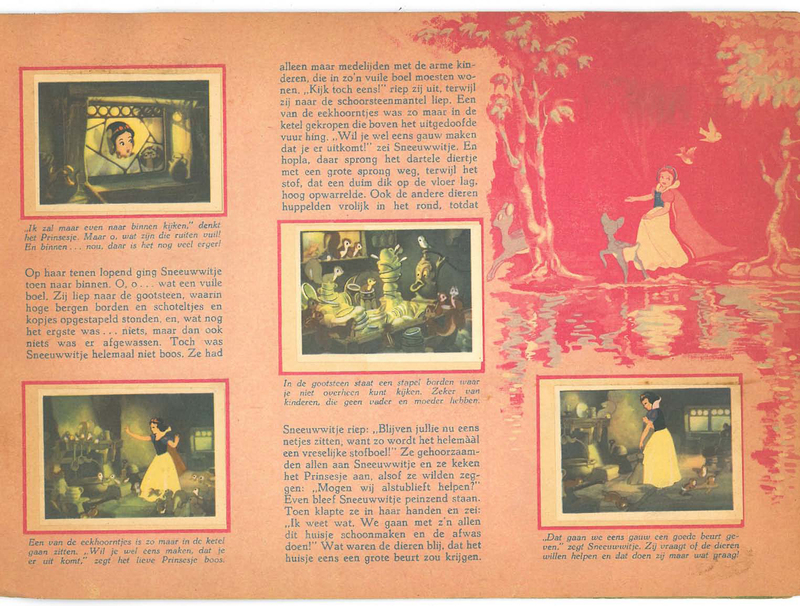 Also the individual stickers vary in size and feature images taken directly from the film. Front Cover shows Snow and the Dwarfs decorating for the holidays. No date is printed on the book, but it does mention that it was sponsored by Margriet, a Dutch version of Good Housekeeping magazine. 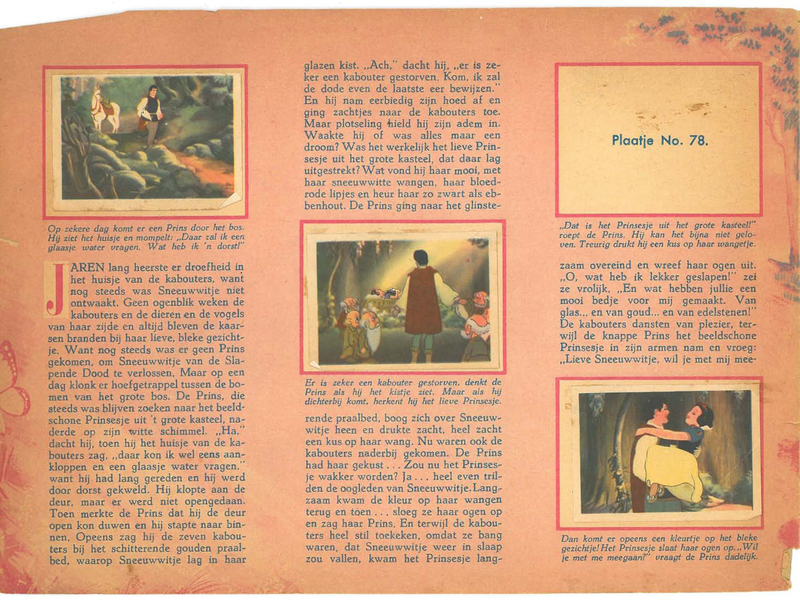 From H.P. 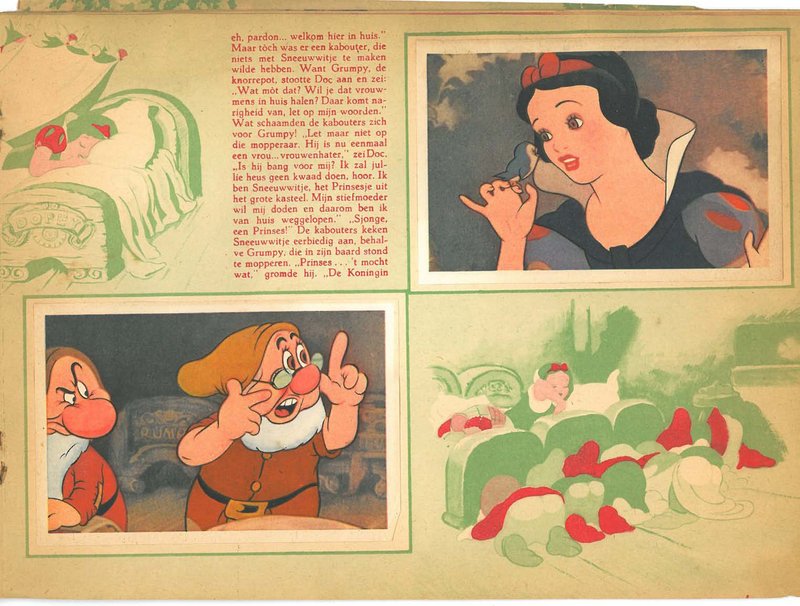 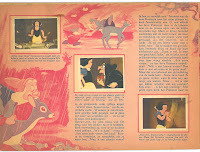 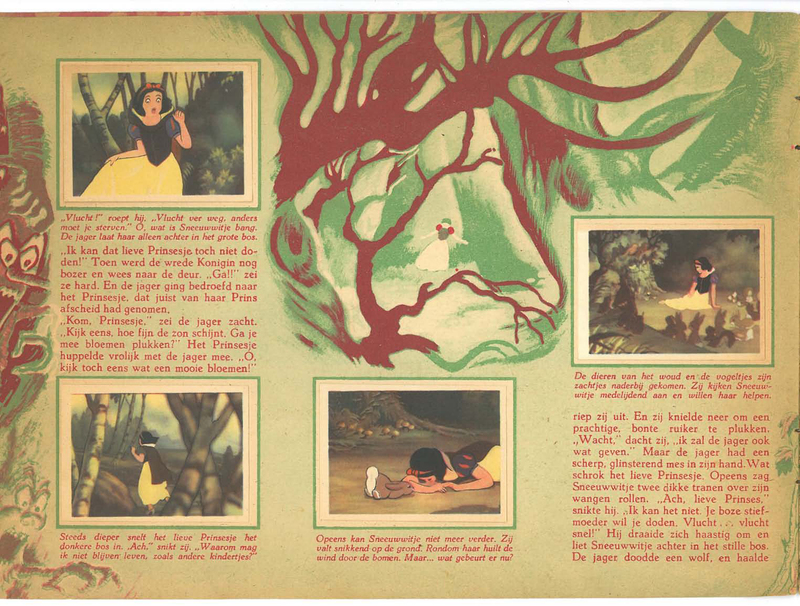 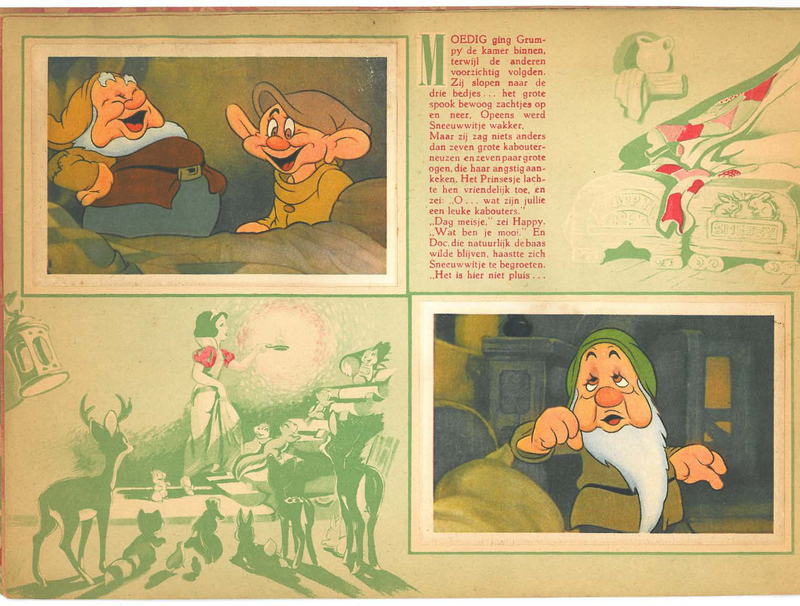 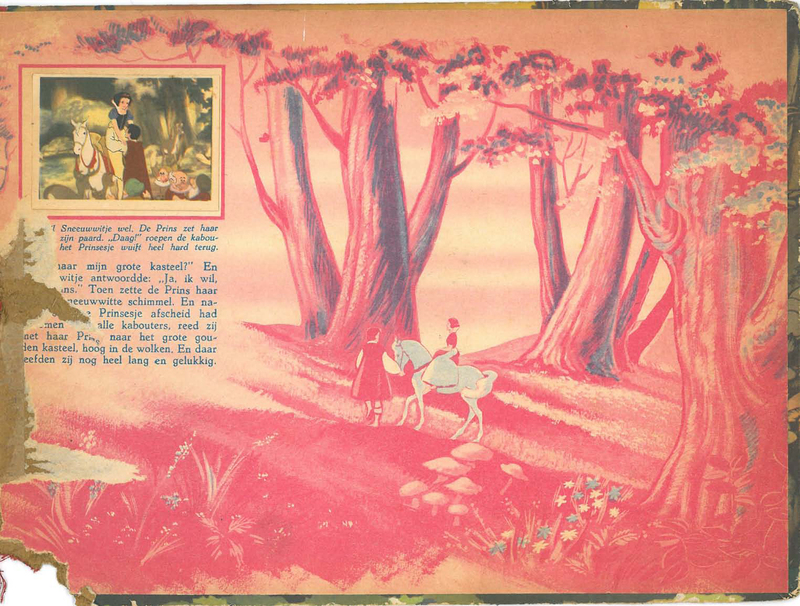 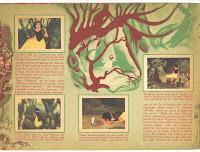 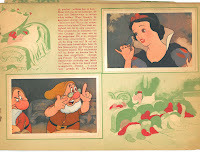 's research, we learn that the periodical dates from the 1950s when it had a collaboration with Disney to print one or two pages from the Snow White story per issue. 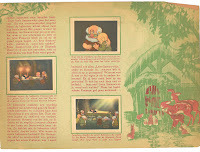 ...and to publish special edition winter books to keep the children busy during the holidays. This is one of those books, which clarifies why the dwarfs are decorating their cottage on the cover, even though it’s not mentioned anywhere else in the book. It's not exactly clear how the sticker cards were made available to the public. 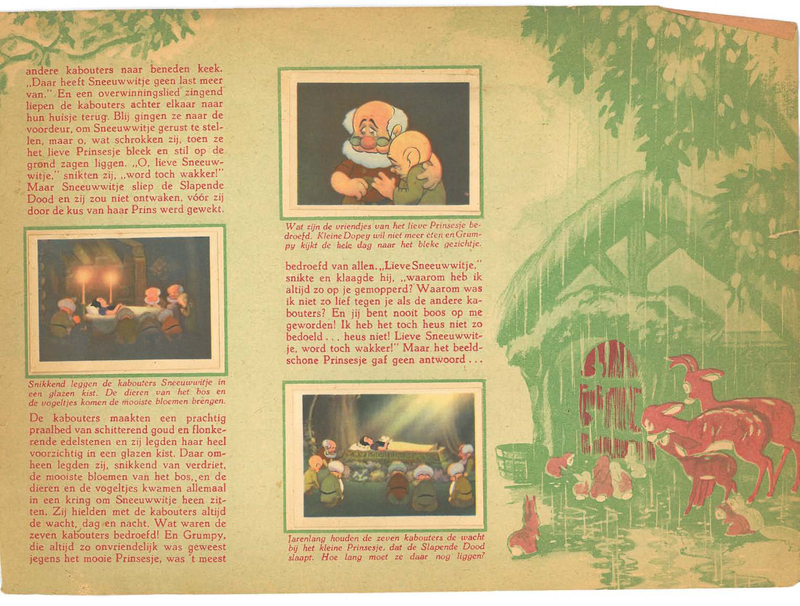 Were they released in weekly allotments with the magazine? Possibly monthly? 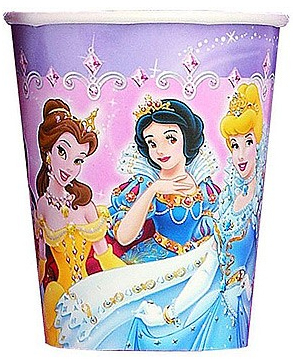 Was it necessary to purchase them separately? 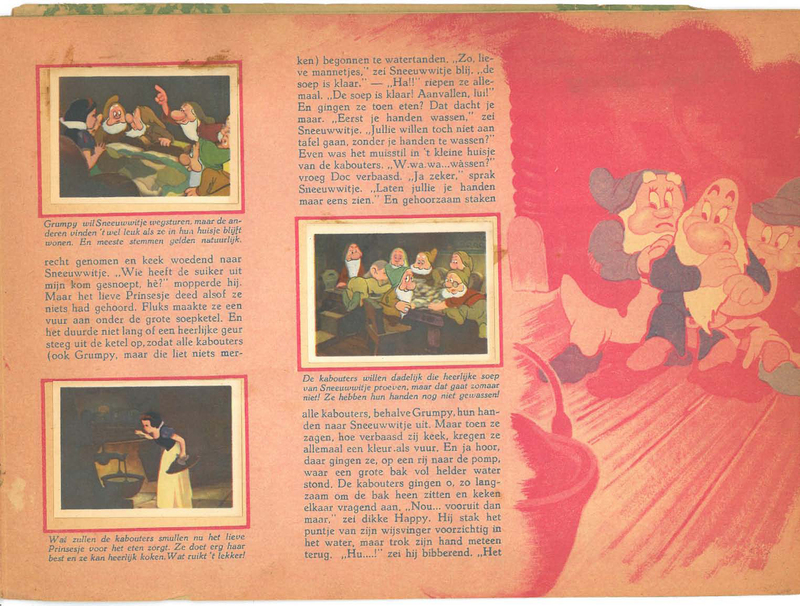 Each has a number and text written on the back, even an ad for the Donald Duck comic. 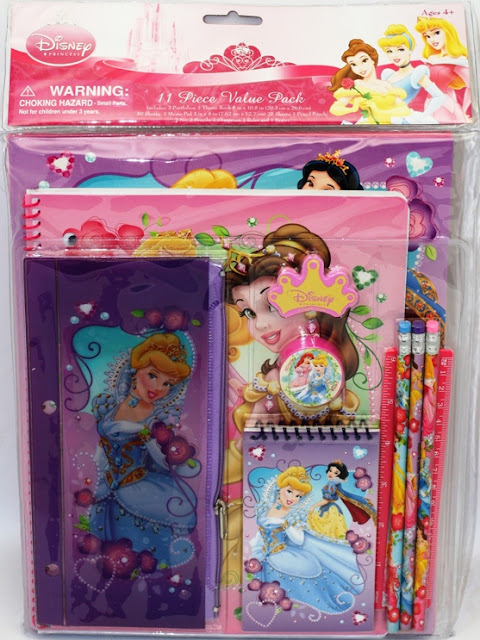 Interestingly, the cards weren't actually "stickers" with pre-adhesive. 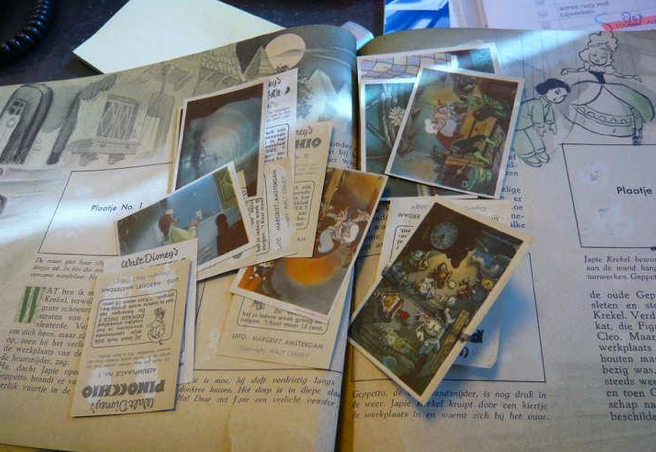 They had to be glued by hand into the book. 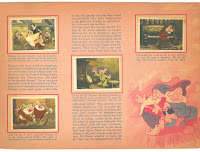 Below is a closer look at a few loose cards from the Pinocchio book in this same series. 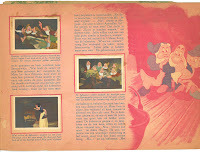 This particular book is quite special, it’s complete apart from one picture that has been lost in time. 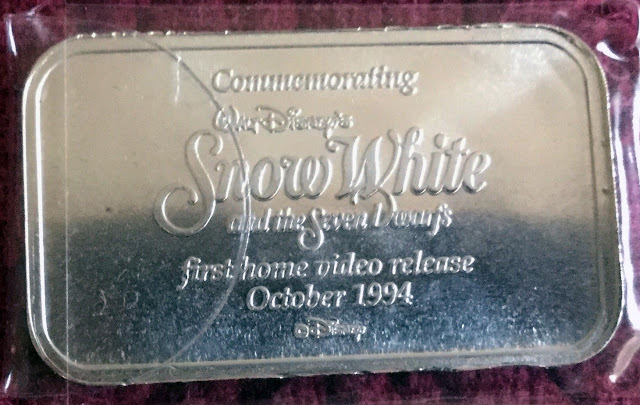 I was told by the previous owner that in those days not a lot of families had money to spare on these trivial things. 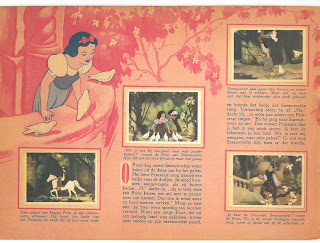 And throughout my searches I have indeed found the books with as little as 3 to 4 pictures. 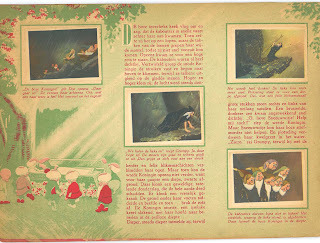 The book itself has been passed down two generations of children and didn’t suffer any kind of artistic vandalism. Most books for children have had encounters with crayons and such. 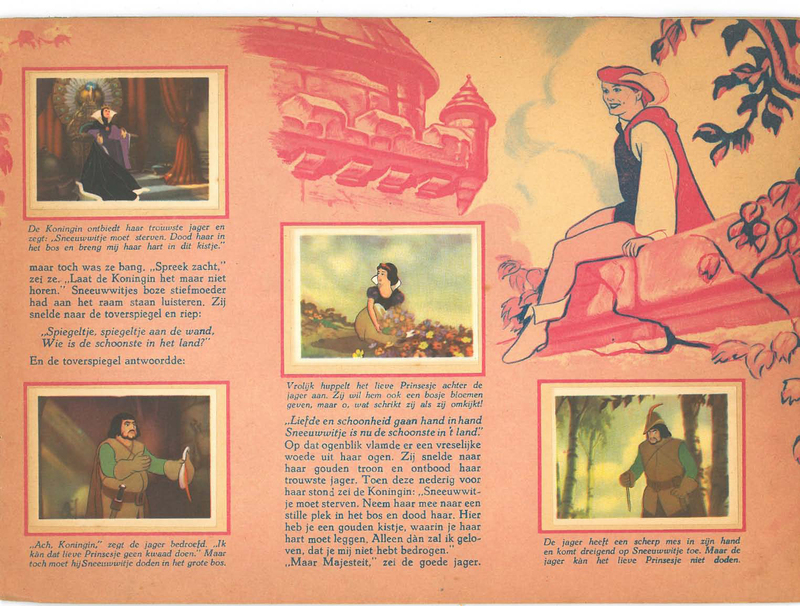 I had a good time reading it again. It holds true to the original story by Walt Disney. 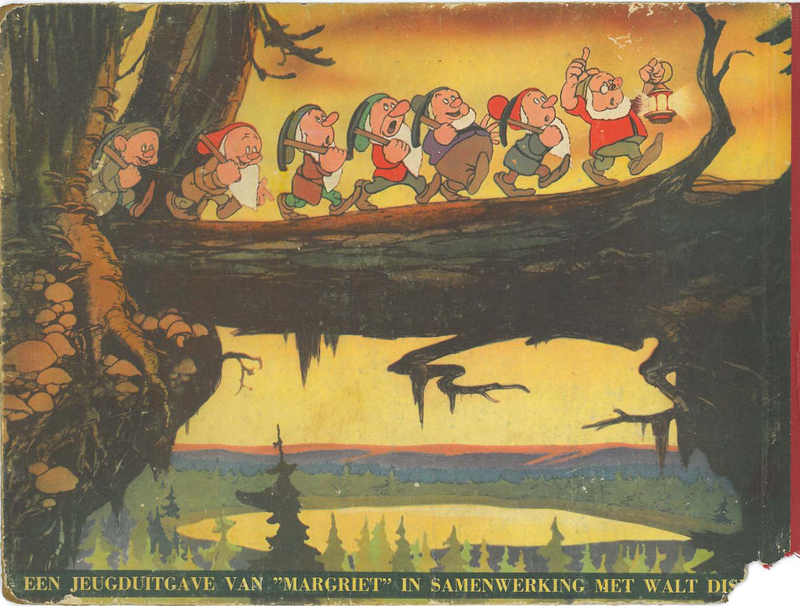 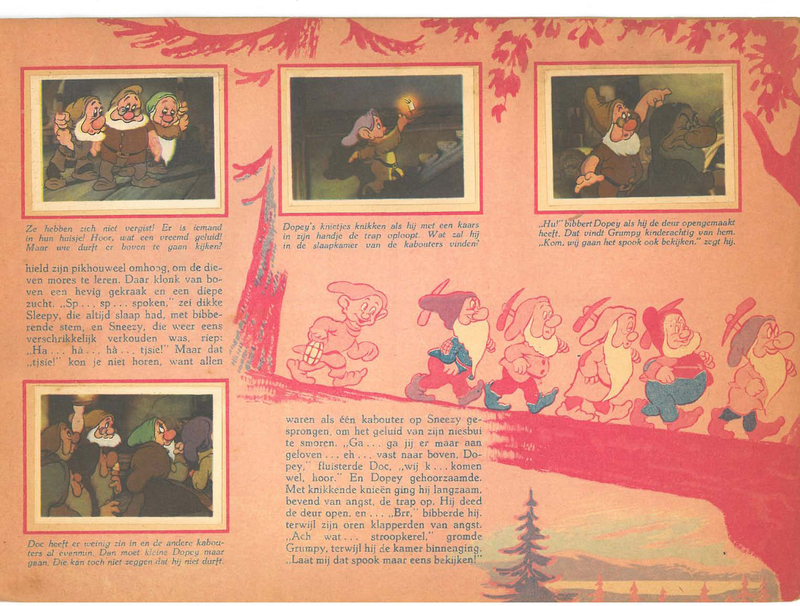 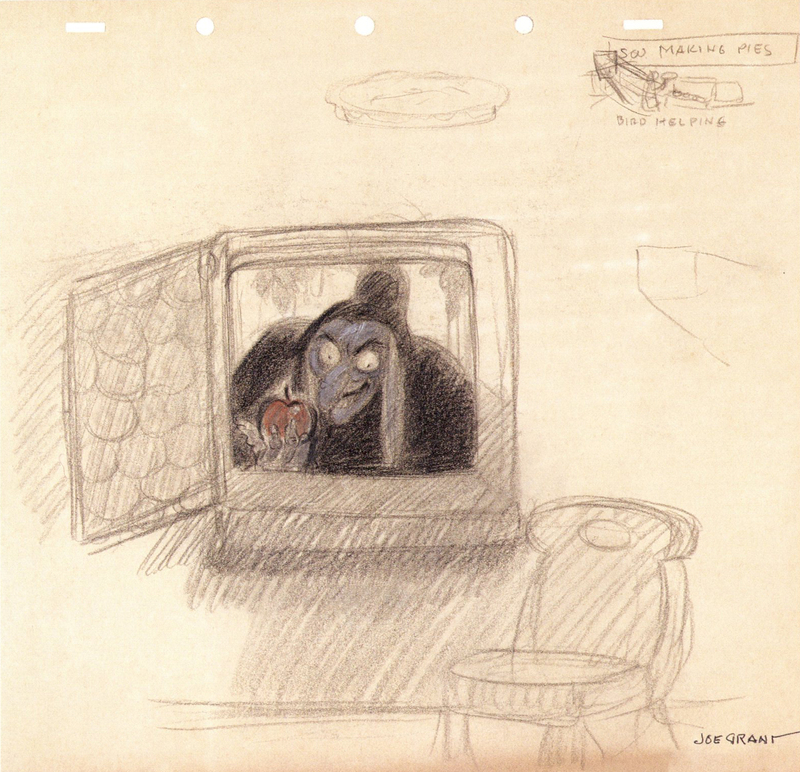 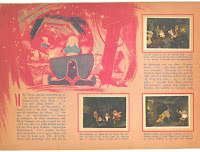 The back cover features the Dwarfs marching home in a Gustaf Tenggren interpretation. 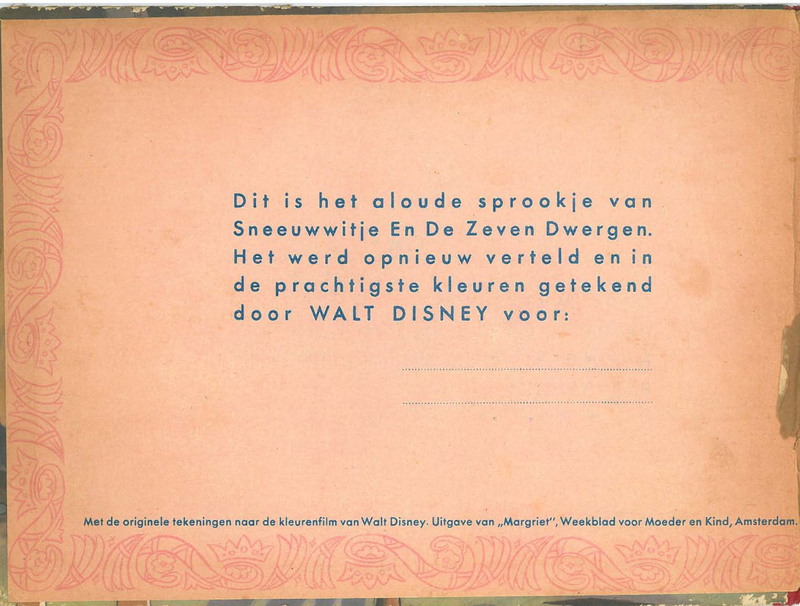 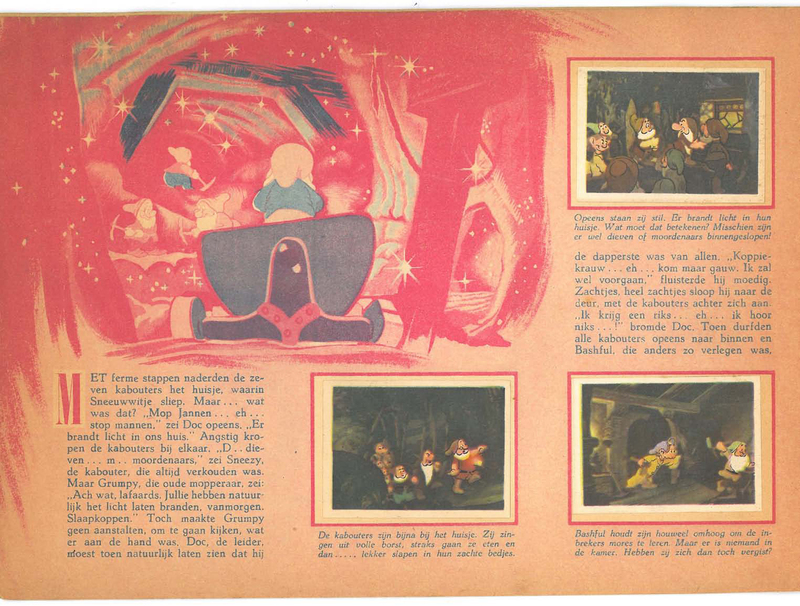 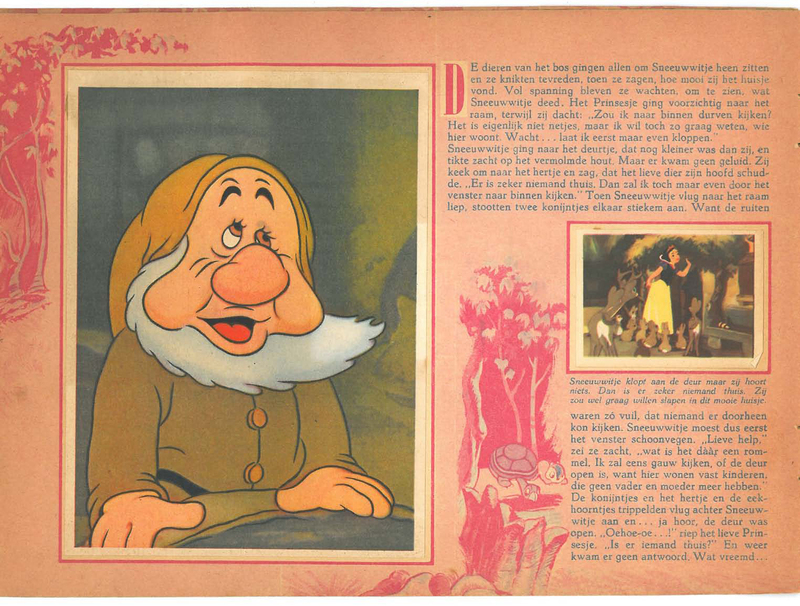 The text at the bottom translates to: "A youth publication in collaboration with Margriet and Walt Disney." 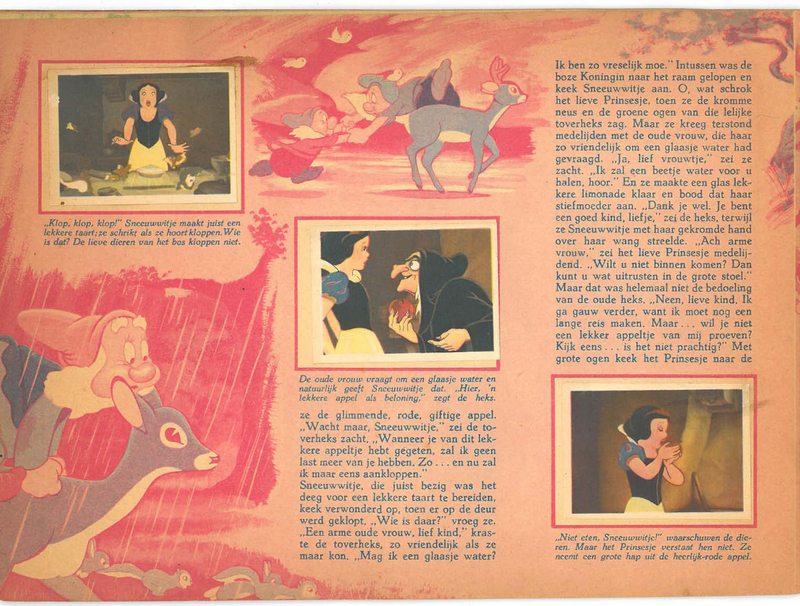 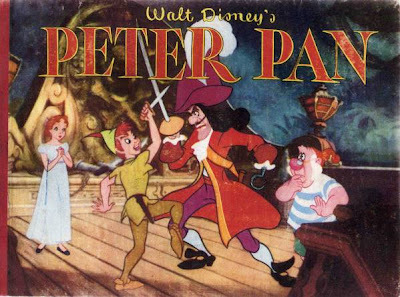 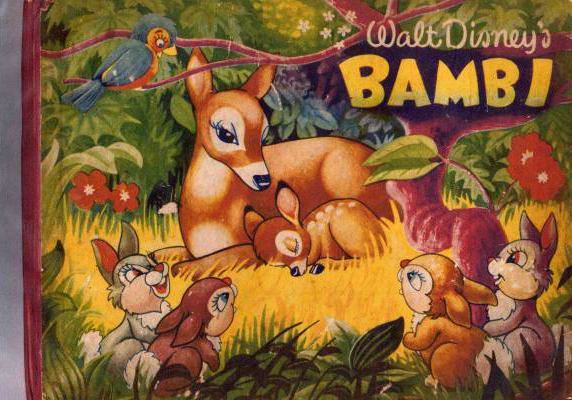 In the same series of sticker books, there was also a Pinocchio, Bambi and Peter Pan. Image scans and information generously provided by H.P. 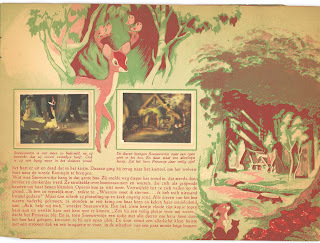 Hogenboom. 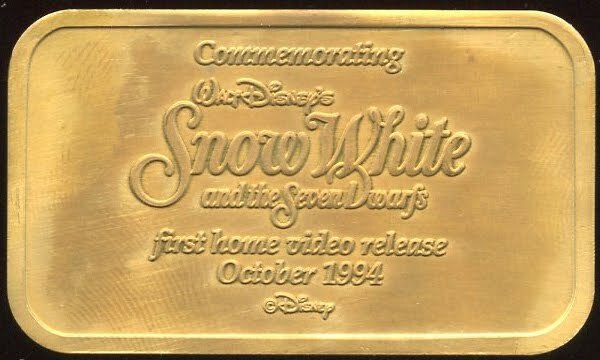 The promotional vestments associated with the first home video release of Snow White also included a two-sided commemorative medallion. 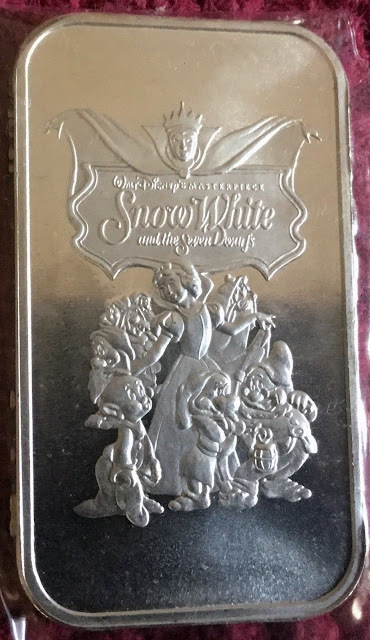 A 1oz. 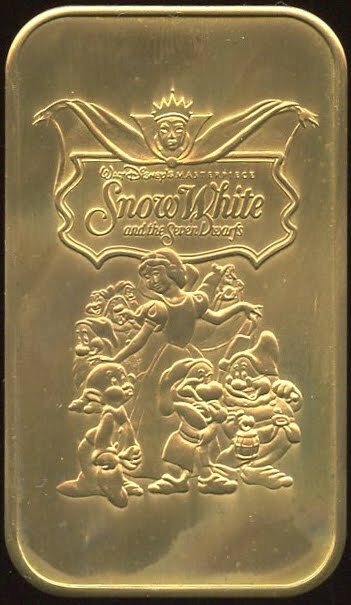 bronze bar, the piece measures 2" x 1.125". 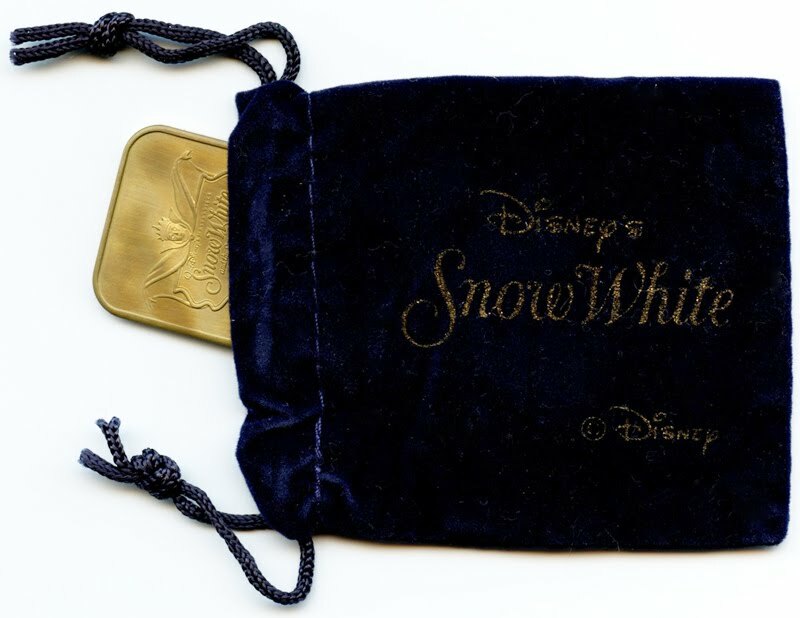 Came in a blue velvet protective pouch. A much more rare 1oz. .999 silver medallion was also produced. 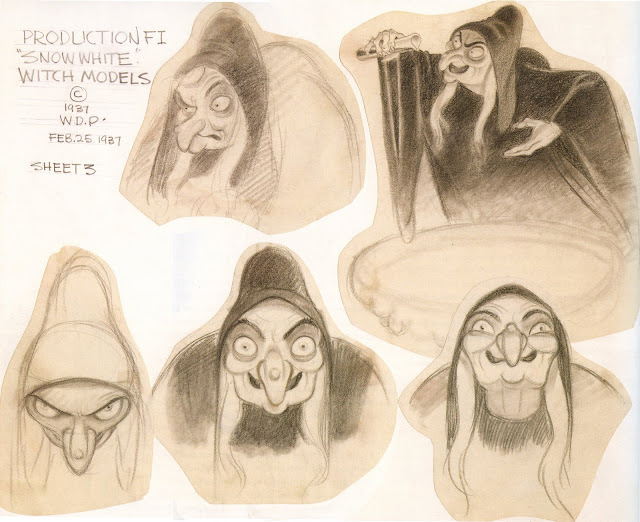 Evil Queen/Old Witch designs and idea sketches by Joe Grant. 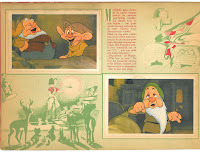 Images copyright Disney, most via the 2010 book Two Guys Named Joe by animation historian John Canemaker. 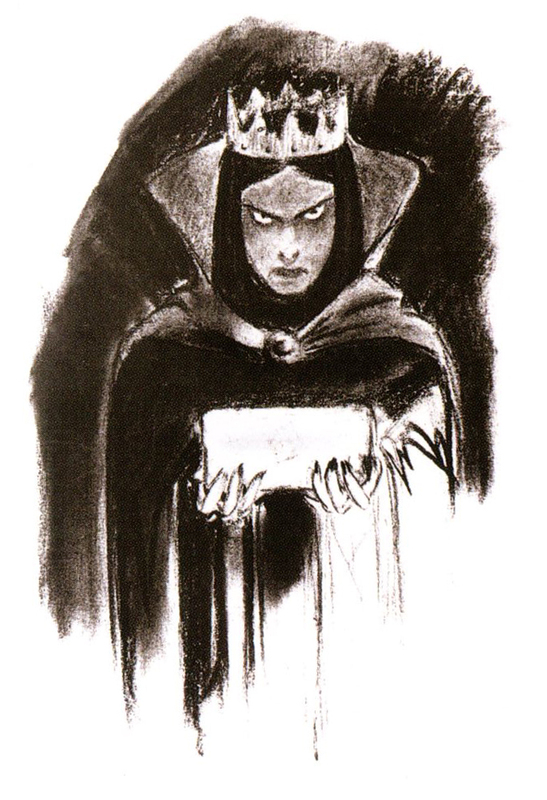 Queen concept drawing. 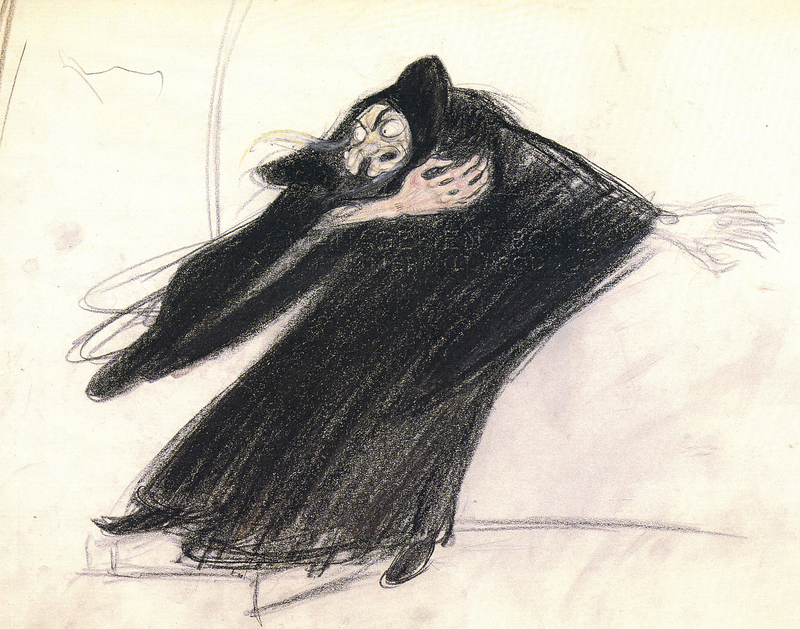 Two Guys...p135. 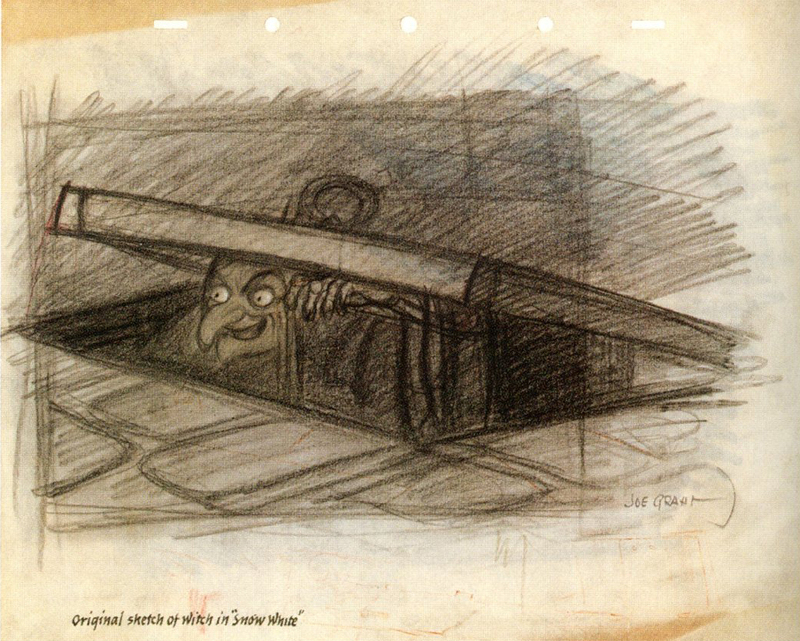 Old Witch sketches. 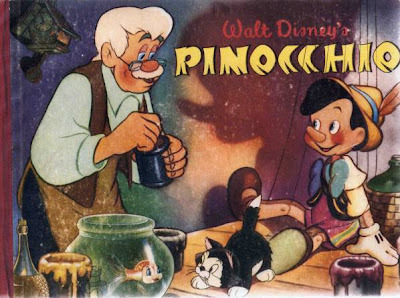 Two Guys...p137-138. 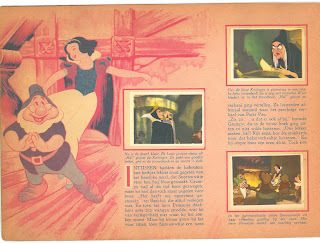 Witch model sheet, Two Guys...p136. Pastel of Witch. 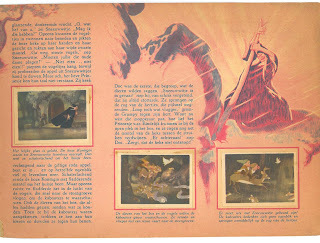 Before the Animation Begins, Canemaker...p52. See earlier post for more on Joe Grant. 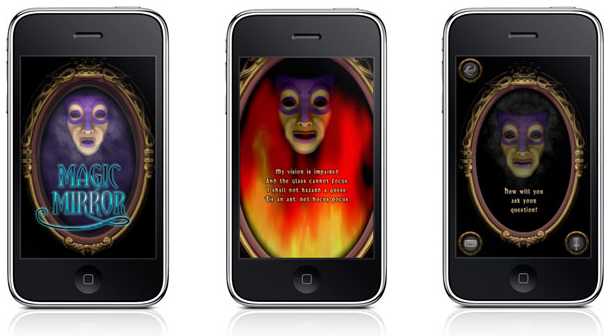 A couple years ago, Disney was selling a Magic Mirror app for the iPhone and iPod Touch. 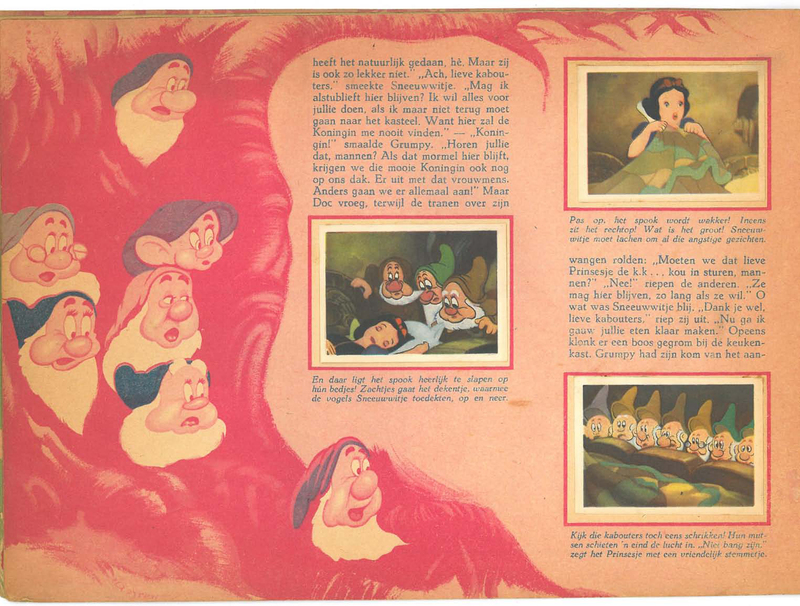 With it, one could receive advice and answers to questions from the "all-knowing" Magic Mirror by speaking or typing into the device. 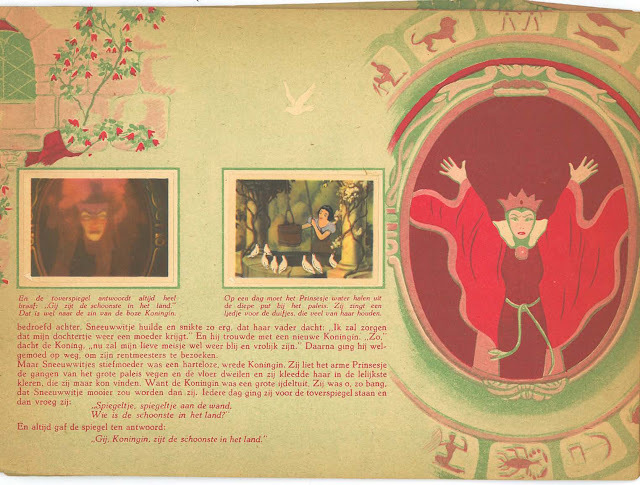 • The Magic Mirror bestows sage advice with dispassionate truth and poetic rhymes! 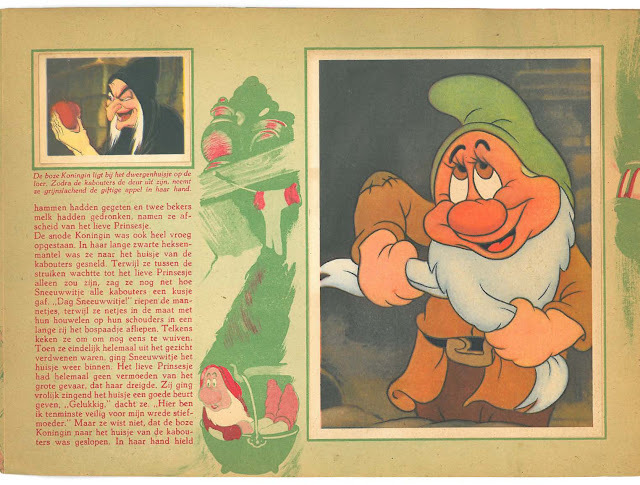 • Ask any question, future or present — romance, friendship, school, or work! • Dazzling animation — just like the film! The Disney marketing tactic of lumping all the princesses together into individual products has never held much allure for me. It seems somehow to lessen the appeal with a feeling of mass merchandising rather than a celebration of the particular characters. 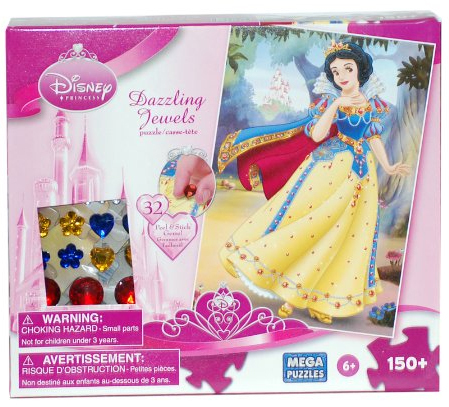 Yet, the Princess Jewels line from circa 2009 had such a fresh take on the design of Snow White (and the others) that I don't want to overlook this series. 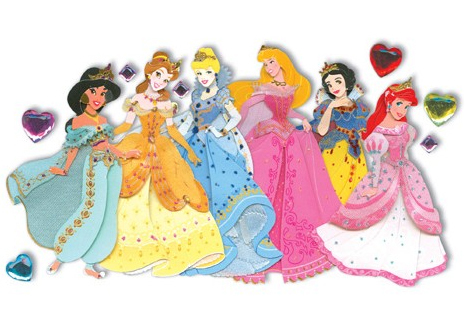 The dresses were redrawn in the spirit of Mardi Gras with plenty of jewels. Dimensional Sticker approximately 4" tall. 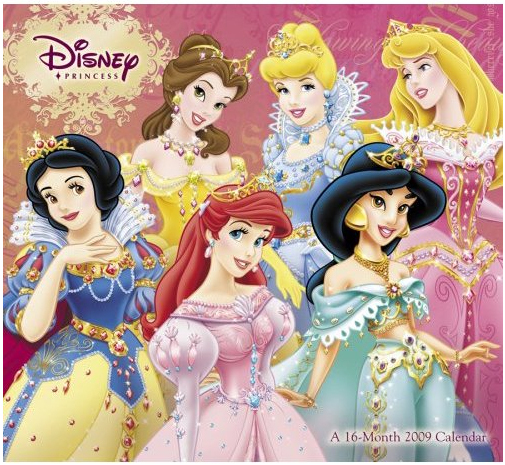 150-Piece by Meg Puzzles. 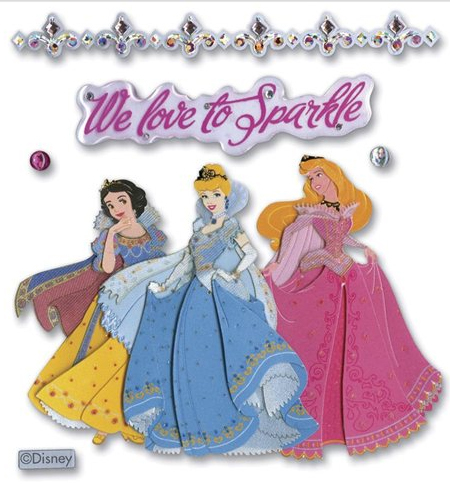 Also included Gem Stickers. 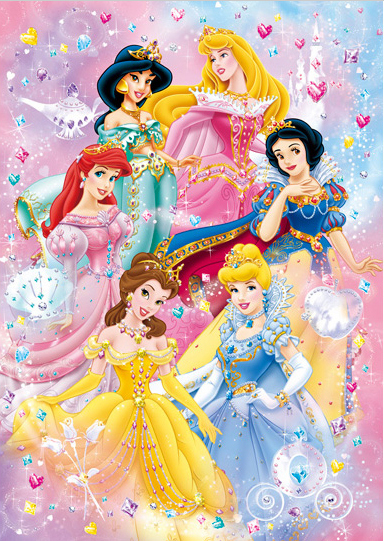 300-Piece by Tenyo Puzzles (Japan). 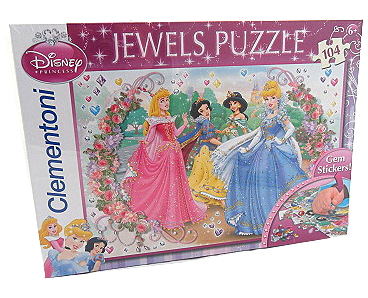 104-Piece by Clementoni Puzzles (Italy). 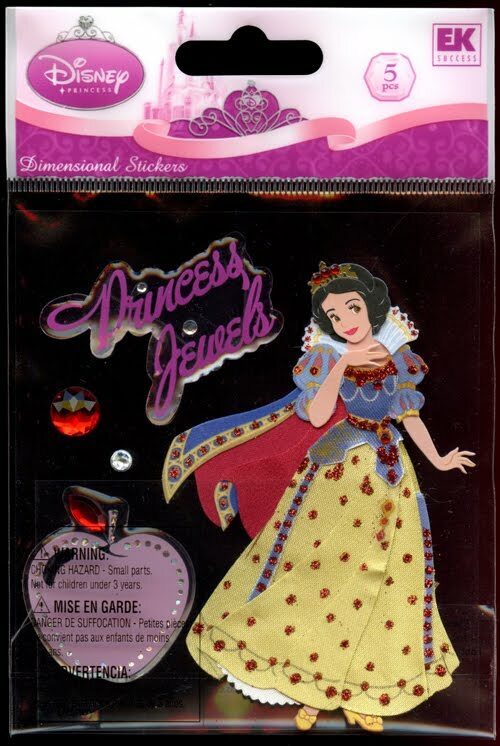 Also included 55 Gem Stickers. 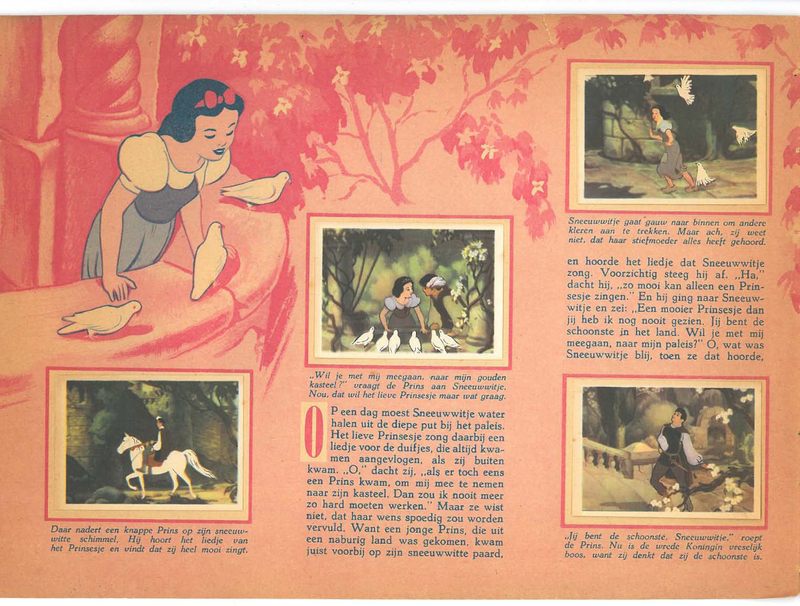 Kleenex Box. 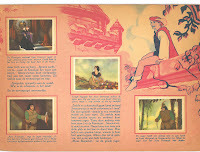 Image via Liana's Paper Doll Blog. 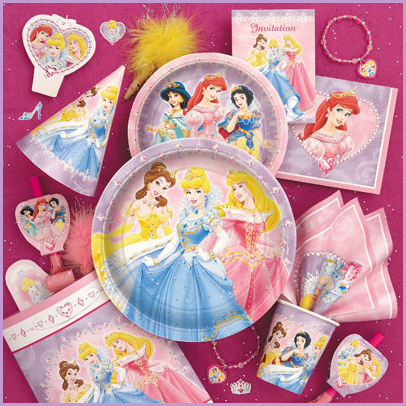 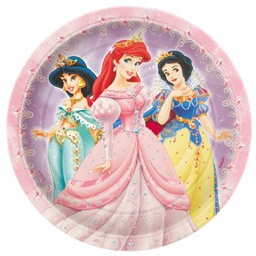 There's more from the Princess Jewels line, quite a bit more, but you get the idea.